14″ shoulder drop. 15″ high. Extra-large dual-zip duffel bag in durable and water-resistant Bi-Tech material. Featuring large front logo and wide compression webbing straps. Adjustable strap with removable padded shoulder. Every serious traveler needs at least one go-to, all-purpose, work horse of a duffel bag. I’ve had the same bright yellow duffel in my closet since heading to college 20+ years ago, and it just recently kicked the bucket. 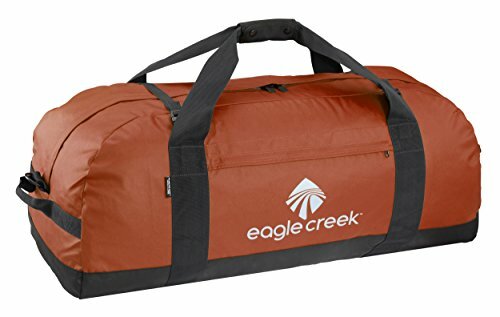 I thought I’d get an Eagle Creek No Matter What duffel to replace it. So far, I’m very pleased. I got the XL, which has 133 liters of space and weighs 2 pounds, 12 ounces’ empty. It’s the largest duffel they carry, and I worried it would be too much bag. Not so. In fact, this duffel has not only gone on road trips and camping trips with us, which is what I usually use duffels for, but even accompanied my teen son on a recent flight. Whereas duffels can be cumbersome to fly with, he found it completely manageable, utilizing the padded shoulder strap before checking it. The No Matter What duffel is made of a water repellent technical fabric that’s incredibly strong without feeling stiff and thick (and therefore heavy). It’s definitely built to travel alongside you instead of being tossed in the back of a pick up (though it could certainly handle that as well). It has quite a few built-in handles for grabbing it either vertically or horizontally, and it features lockable zippers if you need to secure your things when it’s checked. Best of all, a side pocket on the duffel doubles as a stuff pouch, allowing you to compress the duffel to about the size of a small flattened backpack when not in use. Maybe I have too many bags in my closet, but this feature is extremely useful to me. You won’t find a ton of bells and whistles on the No Matter What…it’s simply a well-constructed bag that will get the job done without fuss. It’s water repellent (not waterproof), and I’ve left it out in drizzle without issue. I don’t know if it could stand an ongoing downpour, but your average poor weather won’t be a problem. You get compression straps on the outside to streamline your gear, and there are seam reinforcement in all high-stress areas. The shoulder strap can be removed, and the stuff sack pocket can double as a contained area for muddy clothes or shoes when you have the duffel in use. I love it so far, and anticipate using this No Matter What for years to come. The No Matter What XL is an even $100, and comes in tons of fun, bright colors, including cobalt, firebrick (red), strobe green, black, grape, olive, red clay (red-orange), and slate blue. Find it onAmazon, eBags, Backcountry, and more. Note: you can also get the No Matter What in a variety of sizes. The small is 30 liters for $70, the medium is 59 liters for $80, and the large is 110 liters for $90. There’s also an XL with wheels for $150. The large and XL can be bought in a wheeled version, too. Lots of choice here! We travel almost exclusively with Eagle Creek bags and packing cubes. I find the quality to value ratio to be just right, and so far, trusty EC hasn’t failed me. When I had the chance to try a bag in their new Gear of the Year Award winner, the EC Lync system, I knew it would perfect for my son to use on an upcoming trip that involved plenty of public transit, stairs, airports, and hotels. Why: this pack stores down small, converts to a backpack, and includes sturdy shoulder and sternum straps. That’s right…it’s basically a Transformer. My youngest son is age 10, and rolled and shouldered the EC Lync 22 everywhere he went on a five-day trip. We loved how easy it was to convert from roller bag to backpack. Last year, we checked out Eagle Creek’s FlipSwitch, which also converts to backpack, but my only complaint was how much storage space the straps took up. Eagle Creek has certainly fixed this problem. The straps on the Lync slide very flatly into a back panel, without bulk. The EC Lync system features the new Connect-It Technology. The lightweight frame, wheels, and retractable handle system actually disassemble for storage in an included stuff sac. This is very much a first world problem, of course, but if your closet is over-stuffed with suitcases and bags, you’ll see the benefit of having at least one that will stow away very easily. 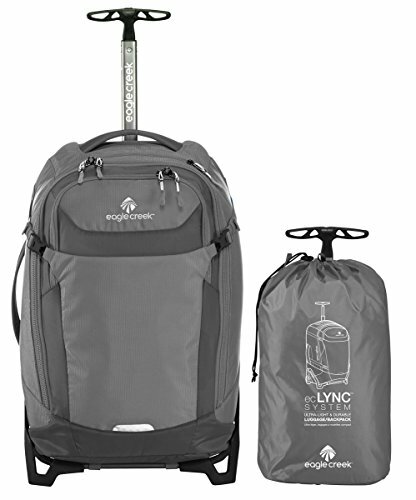 Once in the stuff sac, the whole 22″ Lync bag is roughly the size of a boot box. For us, the main draw is the easy-breezy shoulder strap conversion, which allowed my son to wheel his bag to the tarmac, but carry it off as a backpack, as needed. This was also extremely helpful when we went from airports to trains and metros. It took less than a minute for him to unzip the straps, clip them into place, and heft his bag onto his back. The sternum strap was a bit big on him, but easily fits a standard adult-sized person, and adjusts. And then there’s all the pockets and organization included in the EC Lync. In addition to the main compartment of the 22″, there’s a large external zippered pocket that goes almost the length of the bag (I use this to stash 3-1-1 bags), plus an outer pocket perfect for folding a lightweight coat into. At the top, another smaller zippered pocket is a good fit for ID or other smaller items. You get sturdy, self-repairing, lockable zippers throughout, and a strong handle at the top. There are compression straps on each side, and reflective accents. The weight is 4 pounds, 9 ounces, in ripstop nylon. Pick up the EC Lync 22″ in brilliant blue, flame orange, or graphite. We love the blue! The retail price is $259 on the Eagle Creek site,REI, and Amazon. Additional sizes include 29″, 26″ and 20″. Bi-Tech , Bi-Tech Armor , 1260D Helix Ballistic. Sometimes, you don’t need a wheelie suitcase to pack your gear in for vacation, even if that wheelie is carry-on size. If you’re a great packer or traveling only for a few days, you might be able to pull off a smaller bag. And why shouldn’t you? It’s far less for you to worry about than a checked bag, especially if you have a complicated itinerary. 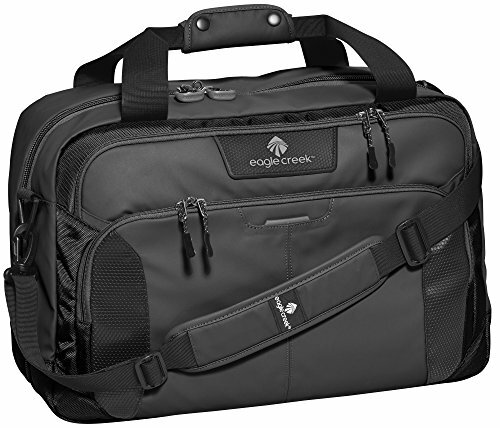 The Eagle Creek Tarmac Weekend Bag measures 19.5 x 13.5 x 8 inches and weighs just 2 pounds 9 ounces unpacked. It’s made from Bi-Tech, Bi-Tech Armor and 126D Helix Ballistic—all which allow your bag to stay soft-sided and comfortable to carry, yet are strong enough to keep your gear protected. There are a few ways you can carry the bag, depending on personal preference, or when you get overly tired of one particular way. Start with the adjustable/removable 60-inch shoulder strap. When you’re tired of that, move to the tote carry handles. Not enough? Next, try the side grab handle. The last option happens to keep your hands free—tuck-away backpack straps that zip them away when you’re not using them. The main compartment opens “butterfly style,” so you don’t have to dig for your belongings, and gives you easy access to interior packing compartments. Compression straps in this compartment strap down your clothing and gear so things aren’t falling all over while you change the bag from backpack to tote. There’s also a front zippered compartment with organizer pockets, pen slots, and a key fob so you don’t lose your keys under everything else. There’s a slip-away luggage tag, so you don’t have to get an extra contact tag for your bag (about 8 different non-integrated tags have disappeared from my checked bags this year), and a back slip panel so you can securely stack the bag on any wheeled luggage you may bring along. Sometimes, no matter how careful you are, bags get damaged. Eagle Creek’s No Matter What Warranty covers not only covers workmanship and materials against defect for the entire life of the product, but also includes repair or replacement due to product failure during the product lifetime, regardless of the cause. During this period, Eagle Creek will repair or replace it at the company’s discretion. The Eagle Creek Tarmac Weekend Bag is available in black, olive and slate blue, and lists for $160 on the Eagle Creek site. It’s also for sale at Amazon. Outside pocket nice for books. Here’s the challenge: You’re packing only a carry-on bag. Do you bring a suitcase or a backpack? The suitcase allows you to take nearly everything you want, but it’s not as easy to bring things along on day trips. The backpack allows you to bring most of what you want and use it on day trips, but you have to always carry it on your back. Suitcases that convert to backpacks are becoming more and more available. 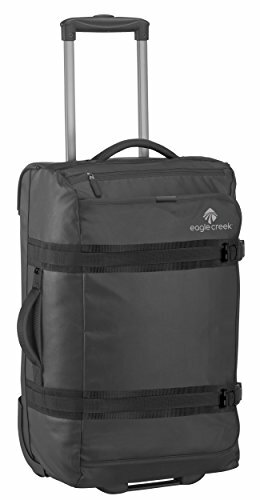 Earlier versions weren’t always the most comfortable, but now that brands are getting in the swing of things, you have products like the Eagle Creek EC Lync System Wheeled Luggage. Choose between four sizes (20, 22, 26 and 29 inches), depending on your packing needs. The three smaller sizes convert to a backpack, and the largest size converts to a duffel. Note, however that only two of those sizes are legally carry-on size. And if you stuff the 22-inch bag with every last thing you can bring on a vacation, it may just exceed that 22-inch dimension. So be careful if you plan to take it aboard. Right out of the box, the suitcase needs assembly. Wait, come back! It’s really easy. Assembling (and disassembling) is so easy that you can do it in a couple minutes. Instructions are included, but once you put the suitcase together once or twice, it’s simple to remember how. No kidding. When you’re not using the suitcase, stow it away in the stuff sack it comes with. This makes it a great choice for people living in small urban apartments instead of a big house with a garage. The over-sized treaded wheels, self-repairing zippers, abrasion-resistant fabric and No Matter What damage guarantee (thanks to Eagle Creek) all combine to make it a trusted bag on your travels, even when they involve adventurous pursuits. The carry on sized 22-inch one weighs less than five pounds with the frame and wheels, less than two pounds when you carry it as a backpack. The larger sizes only add a few more ounces. You gets lots of compression straps, grab handles, and extra pockets. See all the options and a “how it works” video on the company website. 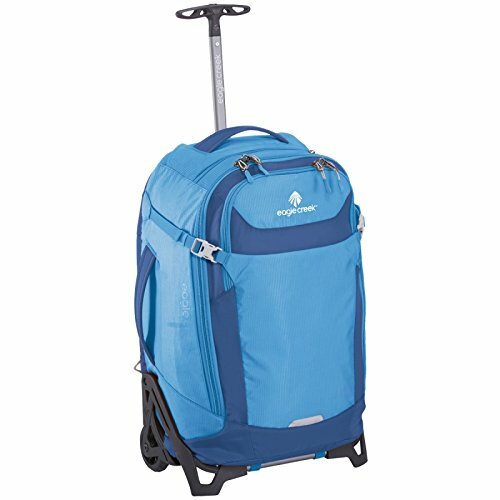 The Eagle Creek EC Lync System Wheeled Luggage comes in Graphite, Brilliant Blue and Flame Orange and lists for $254.95-$299.95 (depending on size) at REI. Constructed with durable, water-resistant Bi-Tech material. With bartack reinforcement on all stress points. Sturdy handle system and heavy-duty oversized wheels. Wheel housing and bumper protection. No matter how many roller boards and carry-on luggage brands I try, I keep coming back to Eagle Creek. I’m convinced no one is making higher quality luggage within Eagle Creek’s reasonable price point. And if I’m ever in doubt, Eagle Creek’s No Matter What warranty is there to back them up. In our family, we use our Eagle Creek Adventure Pop-Top and 2-in-1 backpack duffels at least once per month, and they show virtually no wear. The new No Matter What Flatbed Duffel, which comes in size 22″ for carry-on use as well as larger versions in 28″ and 32″, is great for any traveler, but especially perfect for school-aged or teen children. Why? The duffel is shaped exactly as the name implies, in a very streamlined, flat-topped rectangle. It’s easy to slide in and out of airplane bulkhead storage, which is a huge selling point. My 12 and 15 year olds had no problem, even in a crowded plane with plenty of scowling passengers just waiting to give them grief. The Flatbed also has a very simple, modern design, with bold colors that appeal to my kids. (Have I mentioned this carry-on was taken from me almost immediately by the children?) With a bright red or blue bag, they’re not likely to lose track of it, or misplace it on the luggage cart. The outer Bi-Tech fabric is waterproof, which means the Flatbed can go from tarmac to tarmac without issue, and has only one exterior pocket (which is a nice 3-1-1 zippered compartment). This may sound like a negative, but for us, it’s a positive: too many pockets mean my kids (and I) spend too much time remembering where those headphones were stashed two terminals ago. Remember that No Matter What guarantee? Eagle Creek can offer it because of the reinforcements on all the stress points of the Flatbed, the oversized wheels with bumper protection, and the storm flap protection around the zippers. You get external compression straps that help you really pack the Flatbed to the max, and reflective accents. Often, the handle is the weakest point on a roller board. The Flatbed’s handle feels sturdy, and slides in and out without any resistance. Inside, you get one large interior compartment in the Flatbed (more of that simplicity of design at play), plus one generously-sized zippered interior pocket with mesh panel. Yes, you can use Eagle Creek packing cubes with the Flatbed easily. Plus, the lockable zippers have oversized pull-tabs so even young kids can zip them closed. Pick up your Flatbed Duffel from Eagle Creek in cobalt, firebrick, or an understated black for $180. Also available at Summit Hut for a few bucks less, or Sports Chalet.